Recently, I read my first book by José Saramago, and the success of that venture inevitably led to a second look at the Portuguese Nobel-Prize-winner’s world. While Raised from the Ground is perhaps a lesser-known work, today’s review looks at what might be his most famous novel. As always though, the question is, is it any good? The doctor’s wife, the only person untouched by the epidemic, acts as the reader’s eyes in this world of the blind. Through her, we can see how, after initial panic and imprisonment, society starts to crumble as people come to terms with the thought that this may not be a passing event. What would we do if everyone eventually went blind? The scenario also allows the writer to explore what happens when people are unable to look after themselves. Trapped in the hospital, with no supplies of any kind (and with soldiers ready to shoot them if they set foot outside the building), the norms of hygiene quickly disappear. The floors are covered with human waste, and very soon other diseases begin to spread. However, things are no better outside: cities are soon brought to a standstill (driving, for obvious reasons, is decidedly tricky), and the streets fill with rubbish and filth. It doesn’t take long for society to revert to a system of small groups or clans, each looking out for its own interests. It’s a nice moment, but one which is surrounded by (a milky-white) darkness. Surely, this can’t go on for ever? The story, in itself, is impressive enough, but Saramago’s style gives it a little something more, making the novel even more fantastic. Although there are chapters, most of them consist of fairly long paragraphs, full of unbroken sentences, streams of thoughts connected by commas. There are no quotation marks, and a change of speaker is indicated by a comma and a capital letter – long, quick-moving conversations can be very tricky to follow. Blindness has no real names for its characters, with each being described by their function or distinguishing features (the first blind man, the doctor, the girl with dark glasses), a choice which intensifies the (deliberate) feeling of disorientation. Returning to my question – is it any good? Of course it is – it’s a wonderful novel. Credit must go again to the translator, this time Giovanni Pontiero, for the excellent work done in bringing this unique style across into English. 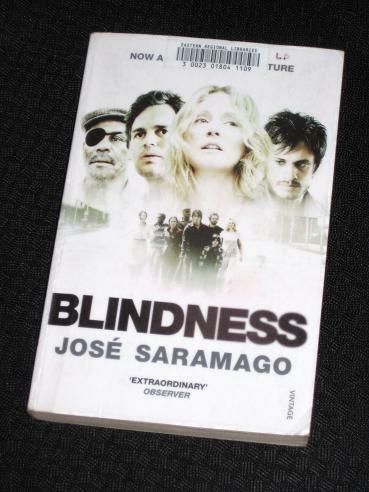 I can’t wait to read more of Saramago’s work, in particular Seeing, the sequel to Blindness. This is one of my all time favourites so I'm really pleased to see that you enjoyed it. I must warn you that Seeing isn't really a sequel and is very different in style. You many like it, but I didn't. I recommend The Double instead, although most of his other books are wonderful too. What an interesting premise for a story. Sounds fascinating. Enjoyed your post. Pam – Thanks 🙂 It's a great read, but definitely style- rather than plot-driven. I'm glad you liked it! When I read it ages ago, it was the most impacting novel I'd ever read, and I actually don't think that's changed in the more than ten years that have passed since. The way Saramago describes the disintegration of society is incredible (and yet what happens is so credible at the same time). I'm glad you liked this novel. It's very well-written, very human and poignant. Don't forget Seeing, it's a worthy follow-up: it reintroduces some of the characters, even though the premise is totally different. I actually prefer it to Blindness. I remember you saying that about 'Seeing' – good to see that of my four comments so far, one recommends that book and another… doesn't! He he, trust me, it's a very humane book, in the vein of Raised from the Ground. I'm glad you liked it! It's the only Saramago book I've read, but I remember enjoying it (but also finding it very unsettling!) I too would like to read more of his work.